Rent a Boat with Captain for a Day! Enjoy the beautiful South Florida weather and the spectacular Atlantic Ocean in no better way than by boat! 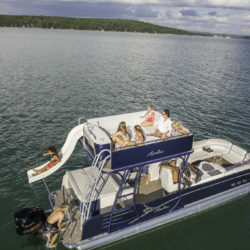 Explore – Party – Cruise in any of most popular boat areas with Fastboatrentals.com Go anywhere around the bay and offshore! Miami, Miami Beach, Haulover, Hollywood, Ft.Lauderdale, and all the Sandbars! Fast Boat Rentals in Big Pine Key, Florida offers you a selection of the newest party boats and pontoons at the lowest rates in South Florida. If you are looking for a boat rental with captain then look no further because all of our rentals include captain and fuel at the cheapest rates! We guarantee your satisfaction and are able to deliver your rental to most drop-offs in South Florida. By choosing FastBoatRentals.com you are choosing the best. Our busiest time of the year is around the corner. Please reserve ahead of time as spaces are limited. My family and I rented a boat from Miamiboat.rentals and it was amazing. The kids and family had a blast! I will def book again! Thank you! I was looking to spend my birthday at sea, and I found Fast Boat Rentals online. The new boats made a difference, the captain was very friendly and we felt very safe. Best birthday ever! Very friendly and efficient team. The booking process and boat check-in are easy and quick. Boats are in good condition and if you choose a nice and sunny day, you will definitely spend a day (or half day) you will remember. Congratulations! You’ve landed on our page which means you are interested in making the most out of your time on the water with one of our tailor-made services. We want you to have a memorable time, and you are simply one click away from enjoying the pristine waterways and enriching activities that make South Florida such a desirable destination. Here at Fast Boat rentals, we are in the business of maximizing your experiences to create memories that will last you a lifetime! We are available for yacht weddings, holiday charters, special occasions, and corporate events and any activity that you can possibly enjoy here in South Florida! Whether you need a boat rental in the Keys, Miami, Miami Beach, Hollywood or Fort Lauderdale, we have you covered to ensure that you have the very best possible experience. Our goal is to make certain that when you step on our dock, you never have to worry about a thing other than having a great time. We started doing boat rentals in 2016, and since our inception, we’ve been making it simple and easy for anyone to rent and enjoy the beautiful shoreline and urban horizon. We strive for the delivering the best possible services at affordable prices. We offer unique services to our clients. Our commitment is to tailor an ideal yachting experience for every one of our customers. Whether you are looking for an ideal corporate event or an organized tour along the beach front, we are here to deliver you the very best in custom experiences to make your time on the water more memorable. We are Fast Boat Rentals. Need to close a big deal? Want a better way to impress potential investors, partners, and clients? When on a yacht, these events are truly something special. Conduct business in style. Depending on your company size and requirements we promise to tailor the experience to what you need. Enjoy the very best South Florida has to offer. Choose from a variety of partnership menus or requests to have on board. Our team of professional chefs have a passion for what they do and is their service to deliver what you heart desires! What better way to celebrate an achievement than an organized party? Enjoy a well-arranged event filled with glamor and festivity to make the most out of your time on the water. Where would you like to go? Our crew is ready to meet your needs. Just tell us where you want to visit, and we will handle the rest. Choose your vessel. Select a destination and relax the rest of the way! It really is that simple. Catch stunning views of the skyline in style. Whether you want to go fishing, look at the dolphins, go snorkeling, sightseeing, sunset tours, family adventures, romantic getaways, cruise by remote mansions perched on white-sand beaches, or maybe you want to simply drink in the experience regardless of the circumstance we have the perfectly tailored package just for you. We know how to handle your boat rental needs. We have a passion for delivering unique experiences and will work very hard to provide you with the best experience for your vacation. Pontoon Boats are very simple and easy to drive on your own a perfect choice for a family getaway. Handles up to 10 passengers and is all-inclusive with a captain and fuel. Surfs up! Are you an Adrenaline Junkie? If so then learn to ride the waves in style. Our sleek design was created to captivate your board guest for an exciting excursion that they soon will not forget. Speed Boats provide a thrilling and powerful cruising experience while covering lots of water fast! Leave the surfers and dolphins in your wake! Watch the skyline fade from view as you zip to the distant islands while viewing the beautiful crystal clear water sparkle beneath you. This is a popular activity for people that are looking to do more than just relax in the sand and surf. If you are seeking an exhilarated rush on the water, there is no doubt that you need to put this on your list. The boat comes with a variety of amenities such as an onboard cooler with ice and waters and an array of cabinets to hold your personal items.